Dubai, UAE, April 08, 2019: It is now 50 years since mankind took its first daring steps onto the moon – a moment that changed history (and the limits of possibility) forever. On this golden anniversary, OMEGA is celebrating the occasion with a brand new Speedmaster that has a very special connection to the astronauts and the legacy of that Apollo 11 mission. Thanks to its robust, reliable and easy-to-read design, the Speedmaster became known as the “pilots’ choice” and was adopted by those in the U.S Air Force. Many of those aces became Mercury astronauts in NASA’s first manned space programme and, in 1963, one of those astronauts, Walter Schirra, took his own Speedmaster CK2998 on the Mercury-Atlas 8 mission. Orbiting the Earth six times, his privately-owned model became the first OMEGA watch worn in space. By 1964, NASA’s space programme was accelerating rapidly and it officially went in search of one watch that it could rely on for all of its manned-missions. Flight Crew Operations Director, Deke Slayton, issued a request for wrist-worn chronographs from different watch manufacturers around the world. Several brands, including OMEGA, submitted their timepieces for the punishing tests – such as thermal, shock, vibration and vacuum examinations amongst others. Only the OMEGA Speedmaster survived these tests and, as a result, it was declared “Flight Qualified for all Manned Space Missions” on the 1st of March 1965. From that moment, OMEGA was the only supplier of watches for NASA’s Human Space Flight Program. It was trusted throughout the following Gemini Program, and, of course, the Apollo Program – which had its sights set on the moon. With the eyes of the world on Apollo 11 in 1969, every piece of technology and kit had to be just right. There was no room for error. That’s why it is such an honour for OMEGA to look back and know that its watches were implicitly trusted by everyone involved. 50 years later, we are still incredibly proud to have timed mankind’s greatest hour. The success of Apollo 11 was fervently celebrated around the world in 1969. On the 25th of November that year, a special “Astronaut Appreciation Dinner” was held in Houston, Texas, in tribute to the moon landing heroes. 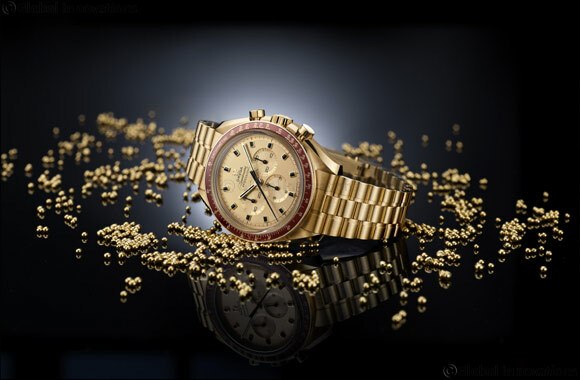 This gold Speedmaster housed the calibre 861 and was OMEGA’s very first commemorative numbered edition, with only 1,014 models being produced from 1969 to 1973. The very first of these was created for US President, Richard Nixon, with number two allocated to the US Vice President Spiro Agnew. These watches, however, were later returned to OMEGA due to the US government’s strict gifting protocol. Model numbers 3 – 28 were given to the NASA astronauts, including 19 of those who were present at the gala dinner in Houston. This also included three models that were awarded posthumously to the three crew members who died during Apollo 1 – Virgil Grissom, Ed White and Roger Chaffee. Watches 29 to 32 were offered to Swiss watch industry leaders and politicians, without any engraved number. The public were given the opportunity to purchase model numbers 33 – 1000. Although these models had a different caseback inscription, reading “OMEGA SPEEDMASTER”, “APOLLO XI 1969” and “Ω THE FIRST WATCH WORN ON THE MOON”, they remained highly sought-after due to their rarity and connection to space. They also came in an exclusive moon crater presentation box, which itself is a prized collector’s item today. It may also be interesting to know that model numbers 1001 – 1008 were later presented to the astronauts of Apollo 14 and 17, while models 1009 – 1014 were reserved for other personalities. For true Speedmaster fans, the BA145.022 is one of the great highlights in the chronograph’s iconic history. Not only is it a beautiful watch to look at, with its blend of gold and burgundy, but it also pays the highest tribute to the NASA astronauts who delivered mankind to the moon. Marking the golden anniversary of the first moon landing, OMEGA has produced a new Limited Edition Speedmaster of 1,014 pieces, delivered with a five-year warranty. Following the famous design of the Speedmaster BA145.022, this new chronograph has been crafted from an exclusive new 18K gold alloy and is powered by a brand new manual-winding Master Chronometer calibre 3861. The case, bracelet, dial, hour-markers and hour-minute hands have all been created in 18K Moonshine™ gold - a unique new alloy whose colour is inspired by the shining moonlight in a dark blue sky. In a paler hue than traditional 18K yellow gold, Moonshine™ gold offers high resistance to the fading of colour and lustre over time. The polished and brushed 42 mm case of this timepiece features the asymmetrical caseband of the 4th generation Speedmaster. Around the wrist, the brushed-polished bracelet bears the five–arched-links-per-row design and a grooved clasp with an applied vintage Ω. Remaining true to the historical piece of 1969, OMEGA has included a burgundy bezel ring – this time in ceramic [ZrO2], according to a special patent pending process, with its tachymeter scale in Ceragold™. Following the first generation of the Speedmaster tachymeter scale, which graduated to 500 units per hour, this new model features a marker dot above 90 (also known as “Dot Over 90” or “DON”). The vertically brushed step dial is marked “Au750” for the use of solid gold and is enhanced by the facetted black onyx indexes set in the polished hour-markers, as well as the hour-minute hands filled with black varnish and the black varnished central chronograph seconds and subdial hands. The outer caseback ring features mechanically engraved markings: “1969-2019” and the Limited Edition number highlighted in burgundy, as well as an uncoloured “Master Chronometer”. - a matte-finish black background which accentuates polished markings including, “APOLLO 11 – 50th ANNIVERSARY” and “THE FIRST WATCH WORN ON THE MOON”. Finally, a domed lunar meteorite inlay representing the Moon has been delicately set into the cavity of the ring. Interestingly, the Earth and the Moon on the inner ring have been produced in true proportion (3.67 : 1 in diameter). This Speedmaster is driven by the OMEGA Master Chronometer Calibre 3861 – a manual-winding movement with Co-Axial escapement, silicon Si14 balance spring, Moonshine™ gold-plated main plate and bridges and burgundy markings. For fans of OMEGA history, there are a number of vintage OMEGA logos to be found throughout the design – including on the dial, crown and bracelet clasp. A unique watch in a unique presentation box! Inspired by the original packaging of the BA145.022 model in 1969, OMEGA has created a new crater box that will house each Limited Edition timepiece. The panels of the box are in grey ceramic with 3D printing of the lunar surface. Since every panel is structured differently, no crater box will be alike. Furthermore, the top panel of every box is printed with the image of the Sea of Tranquillity and the landing position of Apollo 11.